Teeth whitening (also known as bleaching) is an effective way to dramatically lighten the shade of your teeth and it’s safe enough for you to use at home. Achieve your optimal shade in just a few short weeks! 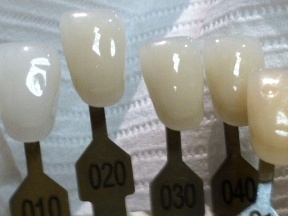 Dr. Matt will take an impression of your teeth and make custom-fitted trays which you’ll take home with you. When it’s convenient you’ll fill the trays with a whitening gel and wear them for one-hour daily. Most people reach their optimal shade within two weeks. Please keep in mind that existing crowns, veneers and composite fillings will not lighten. Dr. Matt will discuss these limitations with you as well as offer any further solutions you may have available. Bleaching is the most effective and affordable road to that gorgeous luminous smile you’ve always dreamed of. Clinical studies have shown that bleaching your teeth not only provides great results with very little sensitivity, but it also improves enamel strength and reduces the incidence of decay.